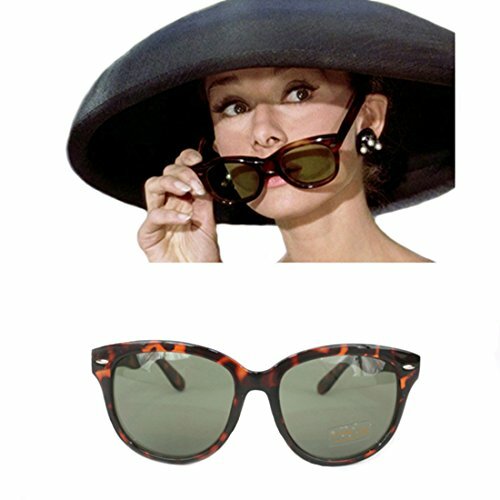 •A signature Audrey style in the form of these vintage, ultra-chic, cat-eyed, tortoiseshell sunglasses that are oh-so-close to the original. These glasses come in the exact shape, style and color as the one Audrey wore in Breakfast at Tiffany's. These amazing sunglasses will surely complete your Audrey Hepburn costume as Holly Golightly and will soon become your go-to sunglasses adding timeless style and grace to your everyday outfits. •These vintage sunglasses come with gentle nose pads and chic arms for an aesthetic feel and comfortable fit whereas the tinted glass offers a UV 400 protection again harmful sun rays. These classic pair of sunglasses compliment most face shapes.